Oh, oh, oh, how the West was fun! 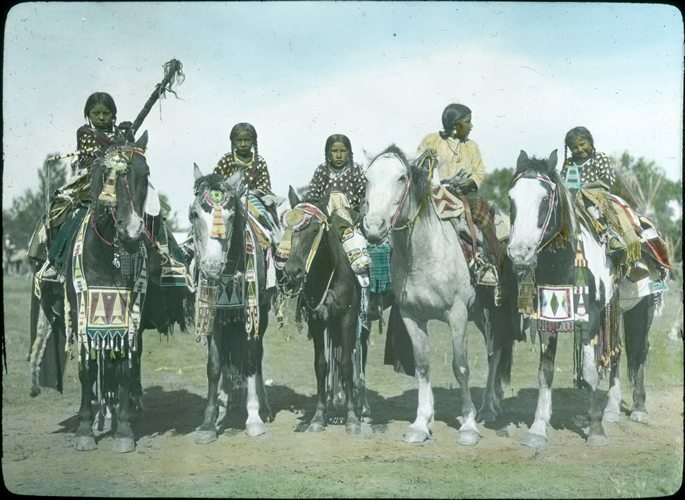 As you recall from my earlier posts on Art in the Garden, we have covered a wide range of topics, from cowboys and cowgirls, to Native Americans, and even wildlife. 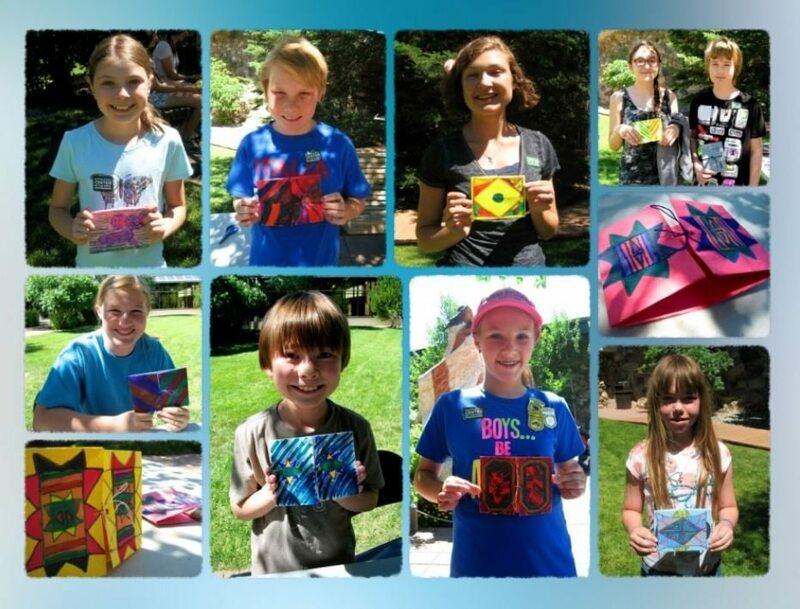 Art in the Garden took place three days a week (Tuesday, Thursday, and Friday). On Mondays and Wednesdays, however, we did something different. We hosted Games in the Garden, during which we have historic games for the kids to play that give them a sense of life in the West. Kids tried playing with grace hoops, buzz-saws, bull roars, and the ball and cup (double and single). The ball and cup toys became so popular that I started keeping track of the record for the most achieved in a row. 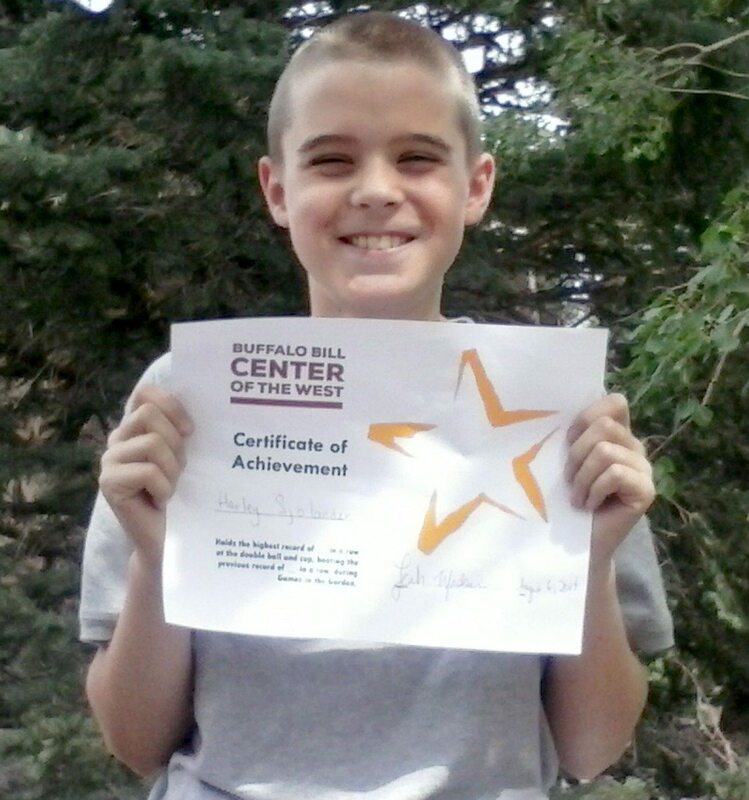 Our program ended last week, with the record for the most achieved in a single ball and cup by Caleb, who had seven in a row. (Unfortunately, I was unable to get his photograph.) The most achieved in the double ball and cup was 16 in a row, breaking the previous record of 14 in a row, by Harley. The kids loved playing with all the toys and always wanted to take them home. 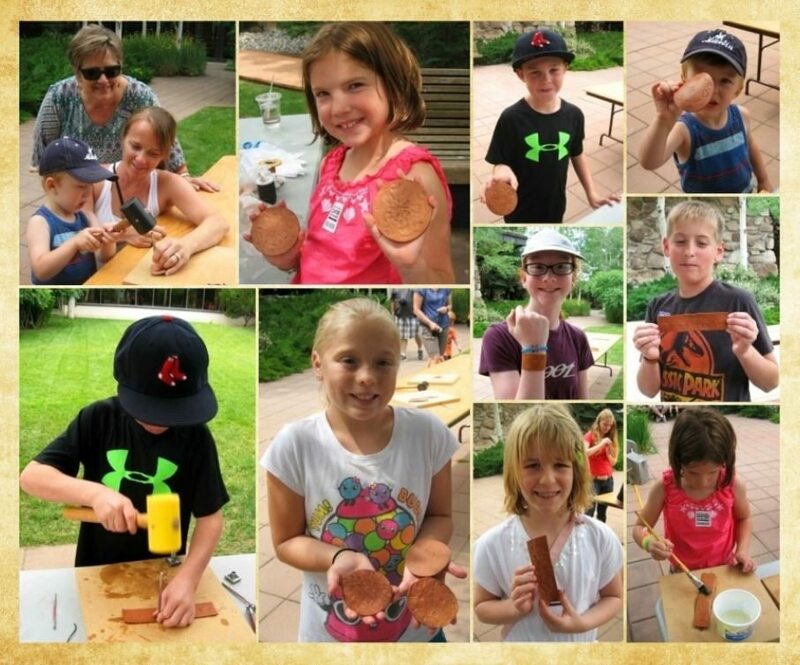 Since games of the historic West were so popular, I decided one week of Art in the Garden would be themed “Fun on the Frontier.” That week kids created things that Native American and settler’s children in the West would have or would have helped create. 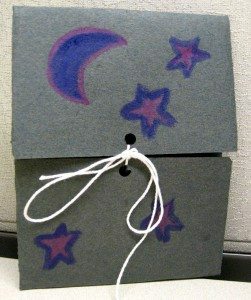 The kids loved these activities and being able to take home their creations. Below I have included instructions for these activities. Make a parfleche at Art-in-the-garden. Today many people use various bags to carry their belongings. Did you know that Plains Native Americans used various bags and containers when they followed the buffalo? Plains Native Americans would carry their possessions in a parfleche. 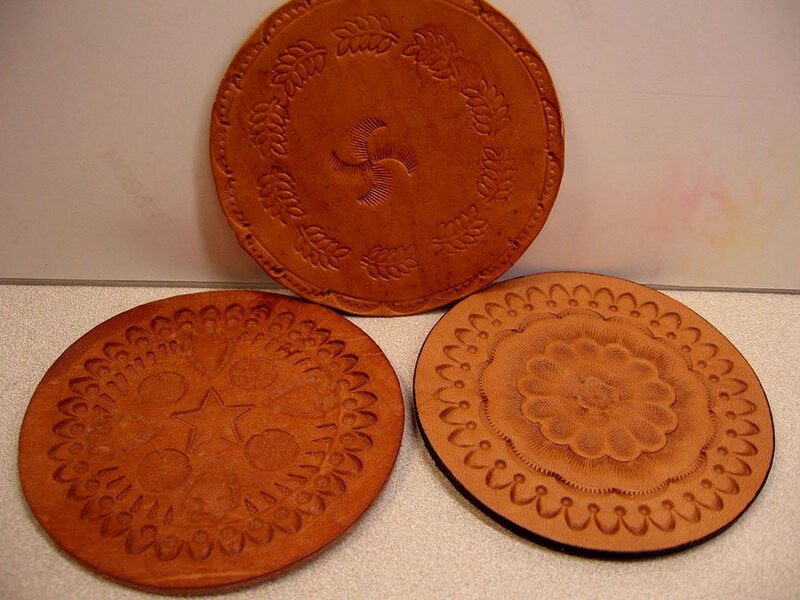 A parfleche was typically made out of buffalo hide. Women would soak the hide, remove the pieces they didn’t want, stretch it out, and scrape it to an even thickness . Women would then paint the outside of the parfleche in different designs. Here you can have fun making your own! Unfold the paper. You should have three horizontal folding lines on your paper. Fold the paper in half vertically. Take one side of the paper and fold it to the vertical center line. Repeat for the other side. Unfold the paper. You should have three vertical folds and three horizontal folds. Cut the four square corners in half so that they are triangular (Figure C). Take the sides and fold them in to the horizontal center line. Take the two far sides and fold them to the vertical center line. The two sides should be touching each other. Decorate your parfleche, by either looking at our online collections or by creating your own design. After you decorate your parfleche, punch a hole in the top fold and bottom fold. Cut some string (it doesn’t have to be too much), and weave it through the two holes, tying it closed. Did you know that kids in the historic West used to make their own dolls out of corn husks? 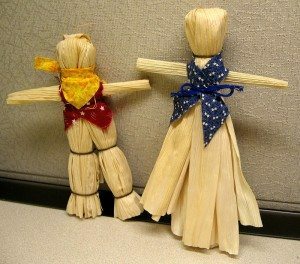 Both Native American and frontier children made corn husk dolls. Many Native Americans believed that everything had a use and that nothing should be wasted. After they ate the corn, the husks would be used for many different things, one being dolls . They taught those settling in North America how to grow corn and create things from the husks . 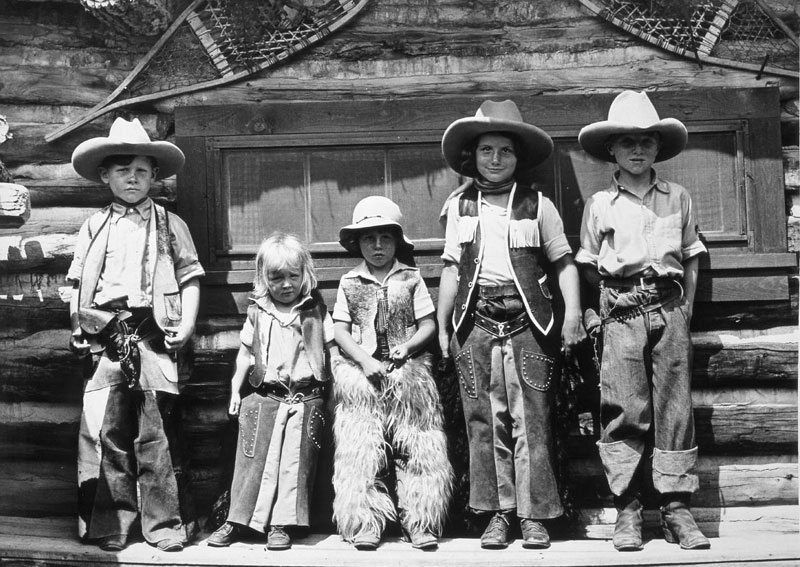 Pioneers who journeyed West took the tradition with them, as many were unable to buy toys for their children. Before you start, soak the corn husks for a few minutes. The husks should be malleable and not rip. However, if you leave them in too long the husks will be hard to work with. Take three to four corn husks of about the same size. Lay them on top of each other. Make sure that the top part has the wider side. Tie a string about one inch from the top of the corn husks. If the corn husks are not the same height, trim the tall ones. Flip your corn husk bundle upside down. Take the part that isn’t tied with string and peel them down, (much like peeling a banana), so they go over the area tied with a string. Then take a piece of string and tie it around the top area that has been folded over, creating a head. Take another corn husk and roll it up. Take some string and tie both ends so it doesn’t unravel. These will be the arms. 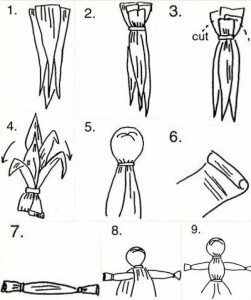 Take the bottom of the corn husk and lift up the pieces until you find the middle, placing your corn husk arms underneath. Take a piece of string and tie it right under the arms, securing them in place and creating a waist. 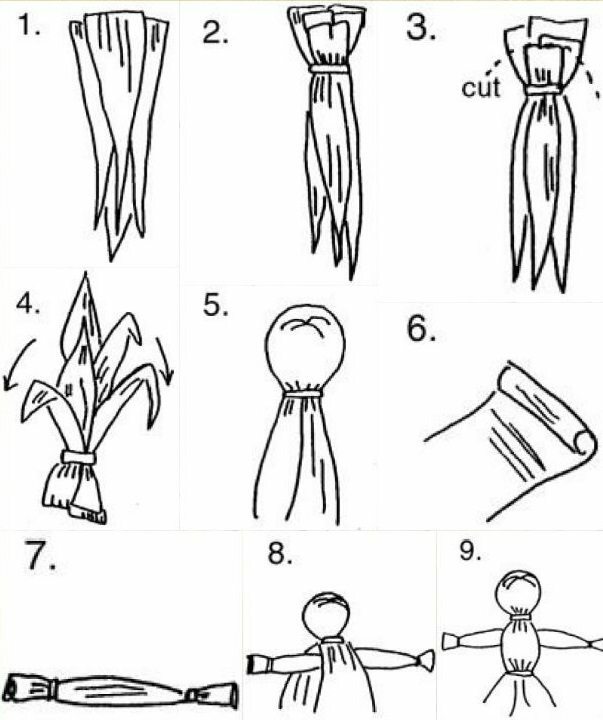 Use the fabric scraps to cut out clothes for your corn husk doll. Follow the above steps, 1 – 9. Now take a pair of scissors and cut the corn husk skirt in half. Take string and tie it around one skirt half, creating a leg. Make sure you tie about halfway up the leg and around its ankle. Let your doll dry completely. Use the fabric scraps to make clothes for your corn husk boy. It was a lot of fun watching people create and dress their dolls. Leather was very important to cowboys. They used it to make hats, chaps, vests, boots, gun belts, belts, and wristbands. Decorating leather became popular because it made the objects more personal, and sometimes more practical (such as with boots). Soak the leather in the tub of water until it is malleable. Take the leather out and place it on a table or board. Choose which leather cutter you wish to use. Place the leather cutter on top of the leather. Hit the end of the leather cutter with the mallet (similar to hammering in a nail). Continue with your designs until finished. Take the brush and use it to paint oil onto your leather piece. If you don’t, the leather will be extremely stiff and hard when it dries. This is a really fun activity, as who doesn’t like banging on things? 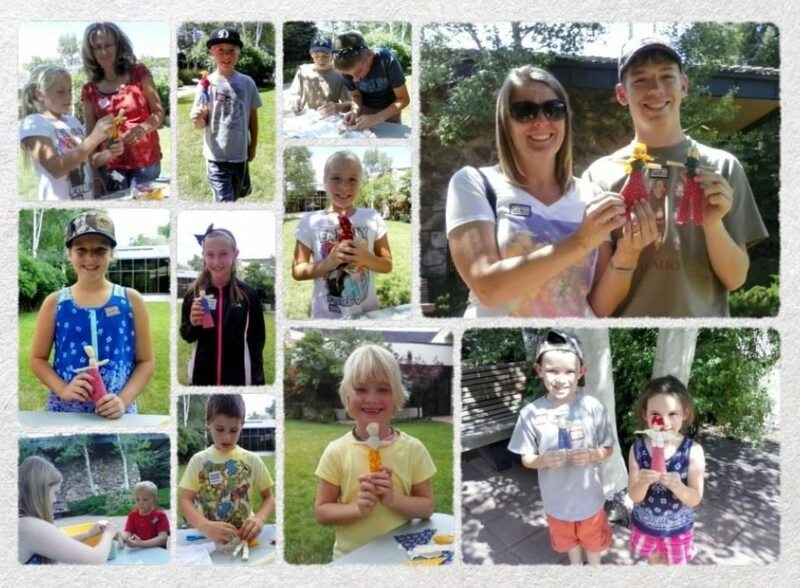 For more of our Art in the Garden activities, go to a Cowboy’s Life is the Life for Me, Native American Arts and Crafts, and Wild Things. 1. “How the West Was Fun.” Performed by Mary-Kate Olsen and Ashley Olsen. On How the West Was Fun. 1994. 2. State Historical Society of South Dakota, “Plains Indian Parfleche,” last modified April 1998, PDF. 3.”Parfleche,” in Frontier and Plains Indian Games and Activities, comp. Morgan Maul-Smith (Cody, WY: Education Department, Buffalo Bill Center of the West, n.d.), 42. 4. Institute for American Indian Studies. Corn Husk Dolls. Last modified 2011. PDF. Agnew, Jeremy. The Old West in Fact and Film: History versus Hollywood, Jefferson, NC: McFarland and Company, 2012. Institute for American Indian Studies. Corn Husk Dolls. Last modified 2011. PDF. Historical Folk Toys. Early American Corn Husk Dolls. Charlotte, NC: Historical Folk Toys, 2004. “How the West Was Fun.” Performed by Mary-Kate Olsen and Ashley Olsen. On How the West Was Fun. 1994. “Parfleche.” In Frontier and Plains Indian Games and Activities, compiled by Morgan Maul-Smith, 42. 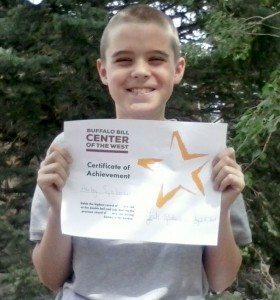 Cody, WY: Education Department, Buffalo Bill Center of the West, n.d.
State Historical Society of North Dakota. “Plains Indian Parfleche.” Last modified April 1998. PDF.